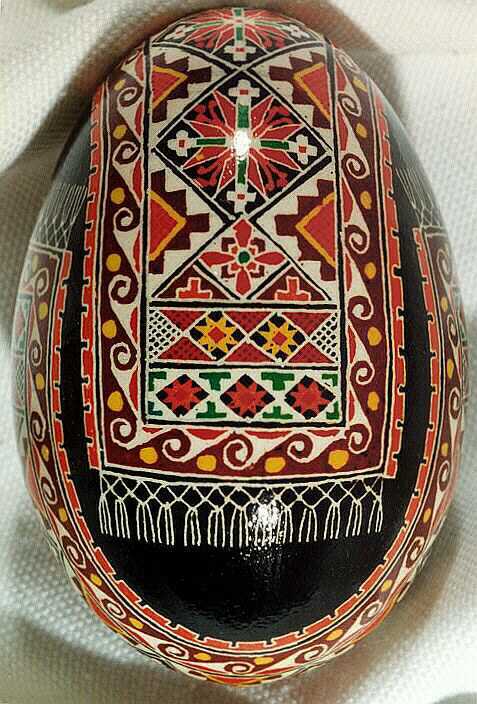 Roman Seniuk's earliest memory of pysanka is seeing the intricately decorated eggs in church on Easter Sunday. They were the most beautiful Things he had ever seen, so his mother helped him learn how to make pysanka himself from various kinds of eggs, beeswax, a kistka stylus, a candle, and dyes. The word pysanka stems from the word pysaty, "to write," because the designs are drawn upon the eggs in a prescribed and meaningful manner. Pysanky symbols include geometric motifs, the sun, the cross, the triangle; endless lines the tree of life, the church, and fish (symbolizing Christianity). The colors of the dyes are also symbolic. The tradition of pysanky decorating precedes Christianity and reflects ancient myths in which the egg symbolizes life, the sun, and the universe. The eggs have been used as talismans to protect against evil, and they serve a variety of social and religious occasions. 1973-1977 Saginaw Valley State College Saginaw, MI. · Graduated with Design and Illustration specialties. · Fluent in both English and Ukrainian with conversational Russian. Designing and casting jewelry for private patrons; Pysanky Illustration for Art shows and gallery's; Freelance Design Consultant for New Graphics Design Studios. He is Available for Demonstrations.